The section of Sydney coastline from Botany Bay to Cronulla is a relatively undived section of the coast. There are a number of reasons for this, the main ones being that the sewage outlet at Potter Point (just south of Cape Baily Lighthouse) used to pour basically untreated effluent into the water and the fact for most of the last 40 years there has been no permanent diver charter boat working out of Botany Bay. Since April 2001 when the Kurnell Sewage Treatment plant was upgraded to tertiary status, the water has been much cleaner along the Cronulla beaches and the coast north of the outlet. Over the past 15 years we have done a number of exploratory dives in this area, especially since the treatment works was upgraded. We have discovered some really good dives, but none as good as this dive which was discovered by John Beddie, a member of my dive Club. To find this spot, head out of Botany Bay and head south along the coast. About 1.5 kilometres from The Leap dive site (this is the eastern most end of the southern side of the entrance to the bay) you will see a headland. 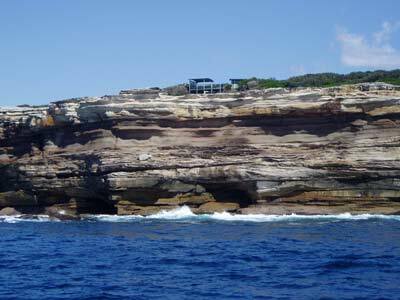 This is Cape Solander. On the top of the reef you will see a structure, the Whale Watching Platform. This was built to provide protection for the volunteers who each year watch the sea off here during the humpback whale migration period (mostly June and July each year) as well as the many thousands who come to look for whales. The GPS Reading for this location is 34° 01' 08.9"S 151° 13' 55.6"E all my diving GPS co-ordinates use AUS66 as datum - read the GPS Page from left if you do not know what this means. Line up the platform as shown in the photograph at right. Run in towards the platform and drop anchor when the depth comes up from 22 metres to 18 metres. 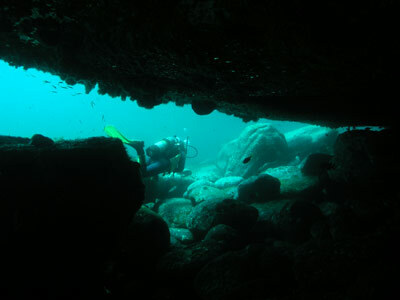 You can also anchor up to 100 metres to the south and still have a great dive. Once you descend and get to the bottom you should find yourself on a rocky bottom that may have some sand patches. If you are a bit further to the south then it may be a bottom with lots of large boulders. The depth should be about 18 to 19 metres. If you are deeper then you are east of the deeper wall. With good visibility you should see the wall to the west. This will be quite shear, dropping from 12 or 13 metres. There are sponges and sea squirts on the wall as well as a few small gorgonias. When you reach the wall, head south to start the dive. Within 20 metres you should come across the first cave. This is quite large, although it is a bit low. You can go inside but there is probably no need to as a good torch will let you see everything inside. 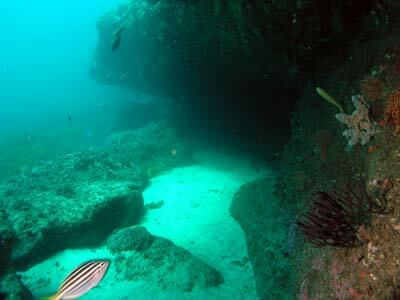 There is an eastern blue devilfish living in this cave and you may also see some Port Jackson sharks on the bottom. Head south again and you will see another larger cave not that far along. This one you can easily swim inside and through, exiting out a bit to the south. You can get some nice photos from inside. See the photograph further down the page. After this, head a little south and then turn to the left and head east. 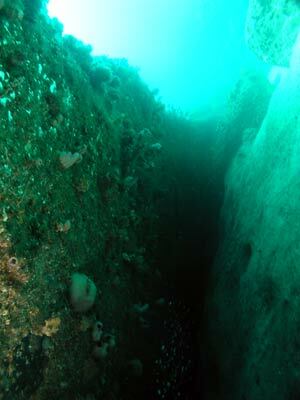 This will take you across the short section of the 18 to 19 metre level to the deeper wall. There is a bit of kelp here. Within 20 metres you will drop over the wall. This goes from 19 metres to 22 to 23 metres. There are some small overhangs and caves in this area. These are nowhere as large as the ones on the main wall. 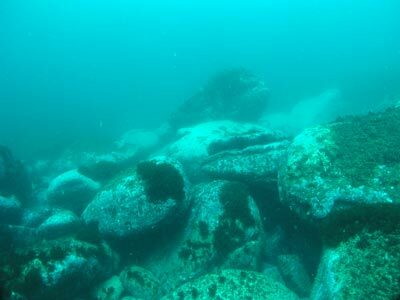 There is a bit of kelp on the sandy bottom here and some small boulders. 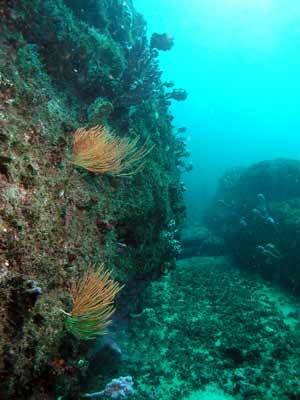 Go south for about 40 metres and you will see some more interesting sections of wall and reef. Turn around and head north. Go back past where you reached this deeper section of wall. The bottom on your right is still a mixture of sand and small rocks with a lot of kelp. 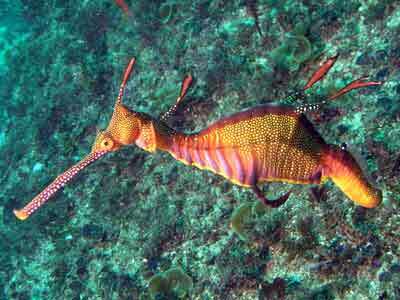 Keep an eye open for sea dragons. I found one here that had its entire tail missing. See the photograph below. I would follow the deeper wall till you pass under your boat (if there is a westerly or south-westerly wind you might be able to see it or the anchor line above). In any case, go north for at least 10 minutes. When you get to the boat or after 10 minutes, head west across the reef till you hit the main wall. If you are north of the anchoring spot, you will hit an even shearer wall. This is quite impressive. If you follow this to the north you will come to an L-shaped corner. This is shown in the photograph at the bottom of this page. It has a small crack in the corner and there is sand in the area off the wall. This is home to stingrays and numb-rays. I also saw an eagle ray in this area. Some of the large boulders at this site A sea dragon missing its entire tail! If you follow the wall you turn to your right and about 15 to 20 metres on there is an overhang. Here the wall turns to the left. About 20 metres along there is another overhang. This extends back a bit and has a very small hole that goes through behind. However, it is far too small to swim through. Past this the reef wall is not a shear wall but some huge boulders. There are lots of small holes and cracks created by the boulders. Head up into this area and you will come up to 15 and then 12 metres. There can be very good fishlife in this area, including one-spot pullers, silver sweep and yellowtail. In this area you will notice that there is a crack that runs parallel to the main wall. This runs off to your left as you swim shallower. It is about 0.5 to 0.75 metre wide and about five metres deep. If you follow this to the south you will come right back to the corner as in the photograph at right. Drop back to the sand and follow the wall back to the anchor. by now you should have been in the water about 40 minutes. At this depth, you will have little no-deco time left so you may need to ascend. If you have some time, explore the reef above the wall before going up. As well as the fish mentioned, you may see many species of leatherjackets and lots of cuttlefish. I also saw quite a few nudibranchs. As this site is located fairly close to the entrance to Botany Bay, you may get affected by outgoing tides if the water inside the bay is particularly dirty, although I have dived here at low tide after 50 mm of rain (when the bay was pretty bad) and had 15 metres visibility. 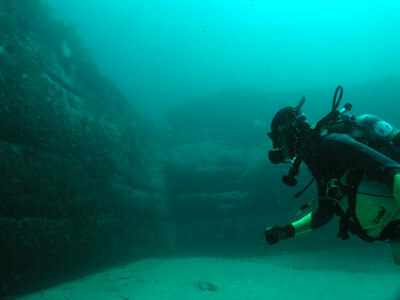 This is a fantastic dive site, one of the most interesting spots I have dived in Sydney. It is worth diving many times and I hope to explore it more with my scooter.